What we had to say about the star system in these columns a couple of Sundays back was measurably vindicated by the mob reception of Rudolph Valentino in Monsieur Beaucaire at the Strand Theater in Manhattan last week. What does a film producer care about a star system or any kind of system when the exhibitors are packing them in ten deep back of the orchestra seats? 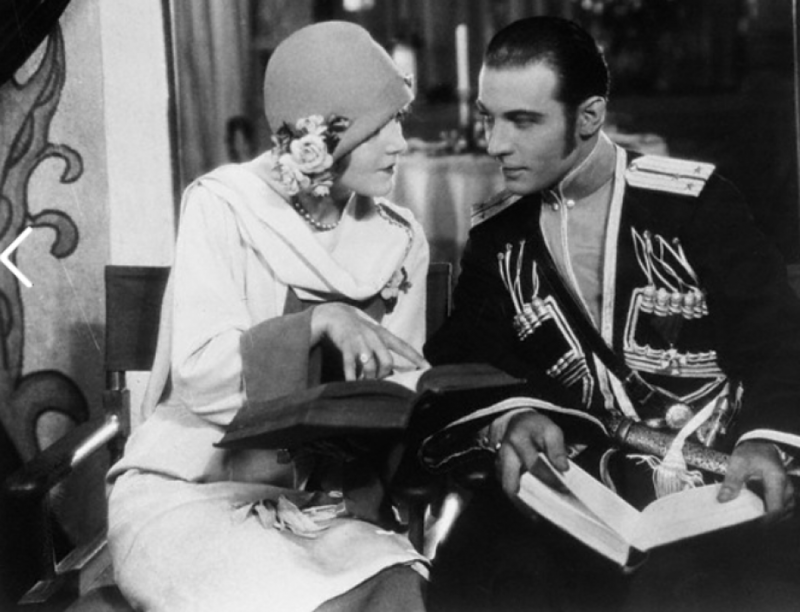 And why should a star like Rudolph Valentino care by whom or in what he is being starred as long as he can keep them coming as they came to the Strand last week? Famous Players-Lasky know a good thing when they see it and as for Mr. Valentino he’d as soon lend his good-looking vaselined scalp to F.P.-L as to any of the other film producers in NY or Hollywood. So there rests the case of the screen star versus the manufacturers of the silent drama and there it will continue to rest until Valentino’s superiors, if there be any, insist that the do another picture like “The Young Rajah” which prompted the sheik to take his much discussed two-year vacation from the screen. The sleek-haired hero of a thousand beauty lotion ads and as many serial lessons in “How to Develop Masculine Charm” have nothing he can take exception to in the generous role of Beaucaire. He is called upon to appear in various multi-colored costumes ranging from the humble raiment of a barber to the more decorative haberdashery of a Bourbon prince. He is presented to advantage in a duel of rather one-sided proportions in which he disperses no less than ten assailants and is rescued by his lackeys only after both his arms had been rendered hors de combat. Then he is photographed in many angled silvery focuses, stripped to the waist the better to display the shoulder blades and biceps made famous by the covers of physical culture magazines. No Valentino can take exception to nothing in the scenario of Monsieur Beaucaire. Concerning those which Booth Tarkington may like to take is a different story. The script for the screen play has been written with but a single purpose in mind. It was prepared for the personal glorification of Rudolph Valentino from the introductory subtitle to the final fade-out arch of his good-looking left eyebrow. It leaves nothing undone to make Valentino’s characterization of Monsieur Beaucaire as much like an Elinor Glyn cavalier as possible. There is too much of the “super spectacle” in it and not enough Booth Tarkington. Those are our impression of Valentino’s first portrayal since his return to the screen and the scenarist’s treatment of what was considered a decidedly good book and a fairly good play. Concerning the direction of Sidney Olcott and the performances of Bebe Daniels, Lois Wilson, Ian MacLaren, Lowell Sherman, and others in the supporting cast we have only words of praise. Taking into consideration the fact that Mr. Olcott was called upon to dramatize a single screen personality rather than the book and play of a famous author. Monsieur Beaucaire reflects a doubly ingenuous direction. He has stitched in a fine thread of subtlety in those scenes in which the action might have been the most obvious. Olcott has eliminated the usual staginess of cinematic fancy dress balls and instead he has given us gorgeous canvases that are more than mere dabs of color. Though their roles are munificent by comparison to that of the star the performances of Miss Daniels, Mr. MacLaren and Sherman are no less impressionable. Monsieur Beaucaire is like the box score in the home team’s shut-out victory. Valentinos pitching wasn’t airtight, but he was given brilliant support.